iiNet, we've tried for months to have you help us and in desperation posted two weeks ago that our office internet connection still wasn't working correctly to give you the opportunity to do something about it. You initially got back to us quickly but have since failed to contact us again despite multiple emails from me. 1. Our wireless network is not working, this is the third Bob modem/router we've used, I've spent over 15 hours on the phone with your team and you can't get a wireless network working for us. I've been very patient, we've been using our kind neighbour Posse's wireless connection (thanks Posse!) on and off for months now but we can't keep doing this. 2. Our wired connection continues to drop out at least twice a day. Again, I've spent part of the 15 hours on the phone with your team trouble shooting the ZyXel modem and you've sent a replacement and still it doesn't work. Usually it only drops out for a couple of minutes which interrupts our office of 10 people, but sometimes it drops out for hours at a time and we have to send the guys without wireless cards in their computers to work from home. This is not productive and has cost us thousands of $ in lost productivity. Again I've tried to be patient with this because it always seems like you almost have the problem fixed but it's been 6 months now. 3. Yesterday I was invoiced hundreds of dollars for an 'incorrect call out' (see invoice below). Your team suggested this after I'd spent 15 hours on the phone and you couldn't solve our issues. I was informed if there were no issues with the line I would be charged an incorrect call out fee, but your team member was confident that was the only issue that could be left after all our trouble shooting. The first technician that came out who didn't work for Telstra told me there was a lot of noise on the line which might be causing the drop outs and that he needed to get a Telstra technician sent to fix it. The Telstra technician came and said he wasn't able to test for the same things as the first technician. He explained Telstra only warrant that 3 tests which they perform will be successful and he said all those were fine. To me, this isn't an incorrect call out. a) It was the only option left to us and b) the first technician said there was an issue which could be causing our connection problems. It's unreasonable and frustrating of you to charge us for this. 15 hours of my time. We are a 17 person business so don't have dedicated technical support. I'm an owner of the business and this role currently falls to me. My time is valuable and I should be spending it trying to grow our business, not trouble shoot your crappy service. At a conservative $200/hr for my time (the opportunity cost is much higher) you have cost me $3,000. We've had periods with no wired drop outs and periods with 3+ drop outs per day. We've averaged around 1 per day and they generally last 5 mins each if they're not a major one. Over 6 months that's ~100 drop outs, 500 minutes or 8 hours. We have 10 people in our Sydney office so that's 80 hours of lost productivity. At a conservative $50/hr for our team members that's a cost of $4,000. We've had multiple periods where the wired connection has dropped out for 4 hours + at a time and we've had to send people to work from home. This results in lost productivity as our team are not on their normal computers and communication is more challenging. This has happened 3-4 times and results in 5 people being sent home at a conservative cost of ~$1,000. As I have it we've paid iiNet $2932.71 for 6 months of internet access that hasn't worked. I've been patient, I've done more than is reasonably required of someone to try and solve these problems and that's because you used to provide such great service with my home connection, clearly something's changed within your business. I've put up with iiNet team members not calling me back 80% of the time they say they will. I've put up with your business support line almost always putting me through to your residential team who can't help me, then waiting on the phone for long periods while they try to find a business team member who can help me. I've put up with having 4 people tell me a manager will call me back to discuss this case and no manager has ever done so. Your business support team member who contacted me after our last blog post promised he would get back to me last Friday and I haven't heard from him since. I emailed the above points to him 24 hours ago and said he had 24 hours or I would post to our blog again. I received no out of office message and haven't heard back from him. 1. We are going to switch ISPs and iiNet will maintain our connection until our new connection is established. A few people have recommended Internode so we'll try them. 2. iiNet will refund the $2932.71 that we've spent on iiNet services since establishing this connection. This is a reasonable request given your service has never worked correctly and the conservative $8,000 in lost productivity we're experienced due to iiNet's terrible service as outlined above. 3. Once we have our new internet connection established I will send back the 2 x ZyXel modems and 3 x BOB modems that you've sent us to date. Please get back to me within 24 hours or I will be taking this up with the telecommunications ombudsman. While it may be galling, I don't think that putting values next to your time and claiming hours lost as money lost is very convincing... Anyway, as you seem to be saying, the best thing do do is just leave them. a) encourage iiNet to actually respond to us - which they did a few hours after I posted this. b) highlight that it's not unreasonable to ask for our $2932.71 back given the additional costs we've borne. They're reviewing this for us now. Great job Michael. I had the same problem with iinet and have moved to Bigpond. I was also charged the incorrect callout fee after wasting several hours with incompetent consultants just like you. The only difference is that I reported them to the TIO and the matter has escalated as they refuse to comply with grant of a refund. Im having the same problem with iinet but am having around 60 dc's a day for minutes at a time. They used to great but since around August last year they have turned to crap, there telling me there some thing wrong inside my home, have had a telstra tech check my gear when they checked my line, and the Bob they sent me. Spoke to a couple of local sparkies who are telling me its iinet. 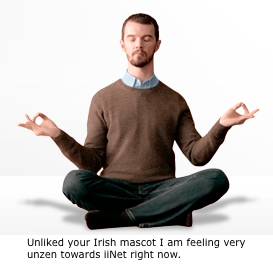 Are you still having problems with iinet? I am and it's ridiculous. Which phone exchange covers your area? "Spoke to a couple of local sparkies who are telling me its iinet"
Protip: most sparkies are struggling with electrical theory, rules, regs and standards (ie: the areas they're actually *supposed* to be proficient in). They're worse than useless when it comes to telecomms and IT matters - you'd be no worse off consulting the plumber. I've also given them about 6 months to restore my services. I have been on the phone every few weeks and as soon as 1 problem is foxed something else goes wrong. The people I speak to have great customer service. They just seem to represent a very poor product.